This page contains our popular Classical Sheet Music in alphabetical order by Composer. Most of our Sheet Music is available in two formats - to view online with the Scorch Plug-In, and to download in PDF format for printing. Below you will find a range of mfiles Classical sheet music which you can play anytime and download freely. We also take this opportunity to mention another site called Virtual Sheet Music which has an extensive collection of good quality classical sheet music for a variety of different instruments. Pieces can be purchased individually for immediate download but if you become a member you can download the whole catalogue of more than 4,500 items. See Virtual Sheet Music Membership - full access to this huge and growing catalogue is by subscription, the first year costing $37.75 and reducing to $25.99 in subsequent years. 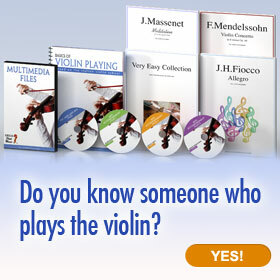 Virtual Sheet Music have just released their Complete Violin Package which contains 4 DVDs of sheet music and lots of training material for taking your violin playing to the next level. Isaac Albeniz wrote extensively for the piano, and his best-known works use Spanish folk dances as their inspiration. The piece Leyenda below, which appears in two different suites evoking the sounds of Spain, has been arranged and played by Segovia on Guitar but presented here in its original piano form, whereas the Tango comes from the composer's Suite "España". Johann Sebastian Bach is the most famous member of a very musical German family. His wrote for many instruments and combinations, and his keyboard works include many for Organ and Clavier. Here you'll find his best-known organ work, and a number of keyboard works from his sets of Inventions and the 48 Preludes and Fugues which come in 2 books of 24 each. Ludwig van Beethoven represents a turning point in musical history as a composer who made his music express deep feelings in a way which was much more direct and vivid than the classical way. Fur Elise is a small piano piece which is not really typical of his work yet is well-known as an relatively easy piece for budding pianists to play. The Moonlight Sonata is particularly well-known for its first movement. We also present movements from two of his Symphonies as excellent contrasting examples of his orchestral symphonic output. Luigi Boccherini was an Italian-born composer who toured Europe before settling in Spain. He was a contemporary of Haydn and wrote lots of works for String Quartet and String Quintet. His most famous piece is the Minuet from one of his String Quintets which we have arranged here for a variety of instruments. Cello Sonata Op.38 in Em (1st movement) Play, or Print Score or parts for Cello and Piano. Frederic Chopin was born in Poland and moved to Paris in the middle of his short life. Although he wrote for other instruments and orchestral works, he is most famous for his piano writing. The preludes below are from his set of 24 in each key (following the example set by Bach in his Preludes and Fugues). Claude Debussy is associated with the impressionist movement in music which mirrored that in art and also seemed to centre itself in France. As well as orchestral works and works for various instruments, Debussy wrote extensively for the piano including the following works. Antonin Dvorak was famous for his use of National music styles into Classical Music, such as his "Slavonic Dances". This example is his much loved slow movement from his "New World Symphony". Symphony No.9 in Em (2nd movement) Largo Play or Print Score and Parts for Flutes, Oboes (& Cor Anglais), Clarinets, Bassoons, Horns 1&2, Horns 3&4, Trumpets, Trombones, Bass Trombone & Tuba, Timpani, 1st Violins, 2nd Violins, Violas, Cellos, Double Basses. Edward Elgar wrote in the style of the late Romantic composers, but with a distinctive English tone. He adapted the slow part of his "Pomp and Circumstance March No.1" with words by the poet A. C. Benson to make the patriotic song "Land of Hope and Glory". Elgar's "Enigma Variations" is a popular large-scale orchestral work, and the variation from it called "Nimrod" is often played on its own by orchestras or bands or solo keyboard instruments such as piano or organ. Edvard Grieg introduced the styles of Norwegian folk music to his works. As a pianist himself he composed many smaller works for piano including the "Lyric Pieces". George Frideric Handel was born in Germany, but settled in England where he frequently composed music for the Royal family including favourites such as the "Water Music" and "Music for the Royal Fireworks". Joseph Haydn was a key figure during the Classical Period. He composed many Symphonies, Sonatas and String Quartets. Here is a representative sample of sheet music from his work. Gustav Holst's "Planet Suite" is his most popular work, full of bold ideas and strong themes. Holst turned one of those themes from "Jupiter" into a Hymn Tune which is labelled "Thaxted" in hymnals and usually sung to the words "I Vow to Thee, My Country". Another Hymn tune by Holst is "Cranham" to which the Christmas carol "In the Bleak Midwinter" is sung. Holst also scored the film "The Bells" in 1931. The Symphonies of Gustav Mahler are quite large, and we can only provide some samples here. Among these examples we demonstrate Mahler's take on the well-known children's song Frere Jaques, and examples used in adverts, on TV and on film. The example from his 5th symphony was used as the them tune in the film "Death in Venice". Wolfgang Amadeus Mozart was born into a musical family, and as a child prodigy performed regularly throughout Europe as well as his native Austria. During his short life he was prolific as a composer using many forms, and did much to shape the development of music. While the two minuets below were composed at a very young age, the Sonata in C was composed in a simple style as a piece suitable for a developing player. The Rondo Alla Turca (in the Turkish style) comes from another piano sonata and is also well-known. The Piano Concerto movement below was used in the film "Elvira Madigan". Minuet in F (K.2) arranged for Recorder Duet and Accompaniment Play or print Score and parts for Soprano recorder, Alto recorder and Piano accompaniment. Minuet and Trio in G (K.1) arranged for Recorder Duet and Accompaniment Play or print Score and parts for Soprano recorder, Alto recorder and Piano accompaniment. Belonging to the group of Russian composers known as "The Five", Modest Mussorgsky's music gets its typical Russian sound from the use of folk music. Pictures at an Exhibition was written following a visit to an art exhibition, the promenade theme representing a person strolling through the gallery and reacting to the pictures on display. As a piano piece full of colour and contrasts, Pictures at an Exhibition was ripe for orchestration, most famously by Ravel. Although Johann Pachelbel composed other music, to many musicians he is known for only one work, this Canon. Originally written for 3 violins and a continuo part, the Canon consists of 28 strict variations, part of his "Canon and Gigue in D", and has become quite a famous work appearing in lots of places. Here it has been arranged as a shorter set of 11 variations, either for piano or for 4 recorders. Canon in D (arranged for 4 SATB recorders) Play, print Score or parts for Soprano, Alto, Tenor and Bass recorders. Like many English composers in the 16th and 17th centuries, many of Henry Purcell's works were for the church, but he also composed material for Royal occasions and the theatre. The rondeau below was used as the theme for Benjamin Britten's variations known as the Young Person's Guide to the Orchestra, and the Queen Mary funeral march was used in the film "A Clockwork Orange". The Russian born composer and pianist Sergei Rachmaninoff often composed in a lush melodic late romantic style. As might be expected from a virtuoso pianist he wrote many works for piano (either solo or with orchestra) but he also composed a number of orchestral works, songs and some operas. Among his solo piano works are 24 preludes, one in each major and minor key. Among much output from the musical career of Camille Saint-Saens is the popular work Carnival of the Animals from which the movements "The Elephant" and "The Swan" are taken. Like that work, his 3rd Symphony also uses a piano (with 2 players) in addition to an organ. Both instruments can be heard in the following extract which was used in the film Babe. Erik Satie was a French composer who chose his own path in terms of musical style. In some ways he was revolutionary and in others merely reactionary. However, he showed that it wasn't necessary to use big dramatic orchestral sounds to move an audience, and his output was inspirational to the French impressionists. He composed a number of simple yet unusual piano pieces like the well-known works here. Schubert's tragically short life was spent largely in Vienna, where is composed many songs, symphonies, and chamber works for small groups or solo instruments including many for piano. In style he follows on from the traditions of Mozart and Beethoven, yet he did introduce some unique features, such as unusual chord and key changes, and a broad sense of time. Robert Schumann had a wide range of interests but is best known as a composer. Together with his wife Clara he had considerable influence on musical tastes generally and on the direction of individual composers. Both "Scenes from Childhood" and "Album for the Young" are well-known as sources of tuneful pieces to stretch the budding pianist. Thomas Tallis, like Byrd, was an English composer devoted to writing works for the church. A few of his works are still used as hymn tunes today. The Third Mode Melody below was used by Ralph Vaughan-Williams as a basis for a work of atmospheric variations. Third Mode Melody (arranged for 4 SATB recorders) Play or print Score and parts for Soprano, Alto, Tenor and Bass recorders. Among the things that Tchaikovsky was famous for, was the creation of music full of emotion and likeable melodies with inventive orchestration. These characteristics were very obvious in his ballet music which included The Sleeping Beauty", "Swan Lake" and "The Nutcracker" from which the "Sugar Plum Fairy" is well-known. Tchaikovsky also composed many short piano works. Vivaldi created much musical output, and The Four Seasons is one of his most popular works. It consists of 4 Violin Concertos usually played together as a single work, of which the following is one. It was used to good effect in the early 70s BBC production of Cassanova starring Frank Findlay. A common practice in baroque orchestral music was to have a harpsichord accompany the orchestra, though it is not unusual for this instrument to be completely drowned out at times. The harpsichordist has the bass part and indications of suitable chords to play called a "figured bass", thus allowing for a certain degree of interpretation or even mild improvisation within these confines. A harpsichord part has been created for this version which may differ from those you may have heard in recordings.